Dr. Muqtedar Khan is Assistant Professor in the Department of Political Science and International Relations at the University of Delaware and a Nonresident Fellow at the Brookings Institution. Democracy and its Muslim Critics: an Islamic alternative to Democracy? each find here material of interest. the most pressing topic of the day. 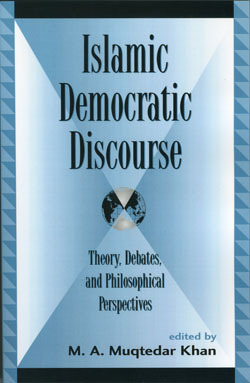 This excellent volume defines the agenda for future thinking about Islam and democracy. It is essential for those who want to go beyond media platitudes and engage with the Islamic intellectual traditions and sources of pluralism, democracy and good governance. Muqtedar Khan has done an excellent job of brining together a broad spectrum of views, with cutting edge scholars presenting the major arguments in current debates. This is a powerful and informative book that addresses difficult issues related to Islam and Democracy. The authors write in concise and simple language, accessible to all, on a subject that can challenge Muslim and non-Muslim readers alike. The outcome is probably the best combination of essays that exists to date. I highly recommend it for anyone interested in learning about the challenges of democratization in the Muslim world today.